A few of the places I have been this past month. I was extremely fortunate to have been the plus one to a media tasting dinner at laV, the newly opened French restaurant at 1501 East 7th. It was fabulous all around! Best sparkling rose I've had because it wasn't too dry for my tastes, Cremant de Limoux, Cuvee Rose, Domaine Collin NV, and it paired wonderfully with the chicken liver pate. As managing partner and lead sommelier Vilma Mazaite said, the pate is filled with butter and cream, so what's not to like? 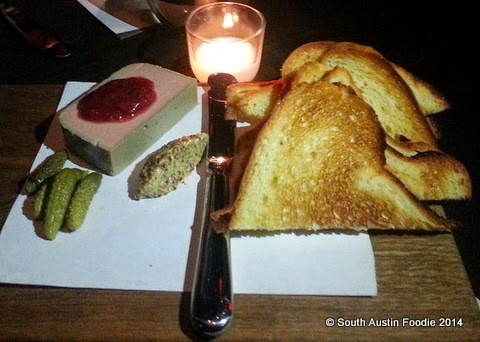 Accompanying it was brioche toast points, berry preserves, cornichons, and mustard. LaV and Winebelly probably have two of the best pates in town. 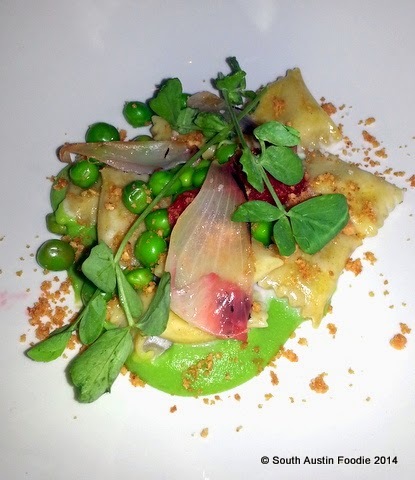 The next course was a sweet pea agnolotti, filled with ricotta, with a pea puree on the bottom, and pressed strawberries and pea shoots on top. It was as beautiful and tasty as it looks. 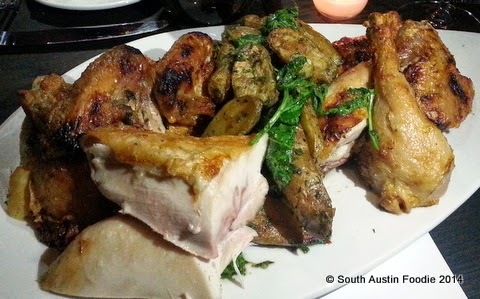 Roast chicken isn't something I would normally order at a restaurant, but this one is special. 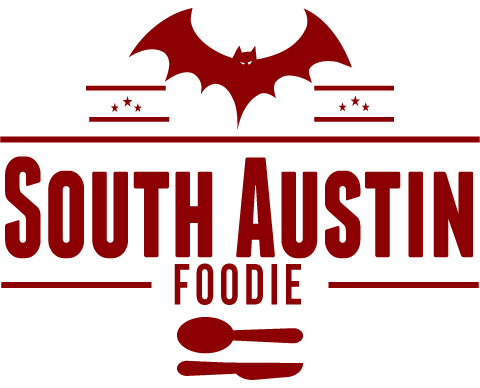 Executive Chef Allison Jenkins said they salt the chickens the night before, and then roast at 600 degrees, breast-side down, for an hour. Served with perfectly-roasted fingerling potatoes, on the regular menu, this dish serves two and runs $48. And worth every penny. 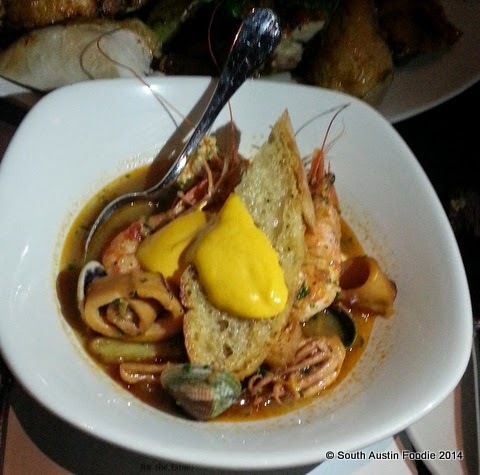 The bouillabaisse was chock full of head-on blue shrimp, clams, squid, and had a distinct orange flavoring to it's broth. And no, that's not French's mustard on the rustic bread, but rather rouille, a saffron and garlic sauce, similar in texture to an aioli (I was unfamiliar with rouille before this!). 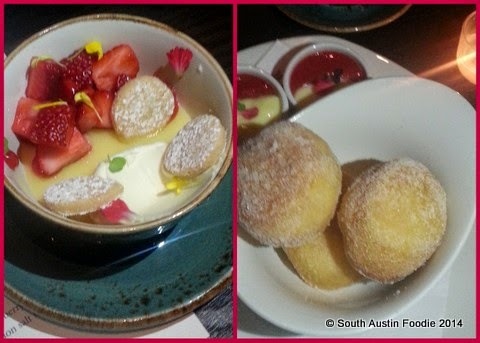 Dessert was lemon and mascarpone budino with local Poteet strawberries, and brioche doughnuts. I could have licked the lovely blue ceramic bowl clean of its velvety contents! LaV has it all going for themselves -- beautiful decor, superb service, and most importantly, outstanding food. They also have a very extensive wine list (several thousand bottles are housed in the private tasting room we were in) and highly knowledgeable staff. 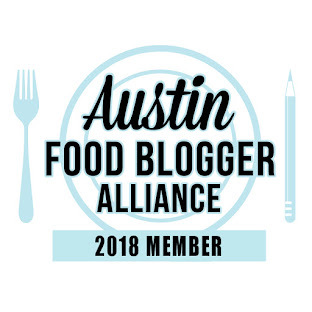 Surely this place will be ranking high on the top places to eat in Austin. Make a reservation and experience for yourselves. And a few other meals of note. Dinner with a friend at my neighborhood Elizabeth Street Cafe. 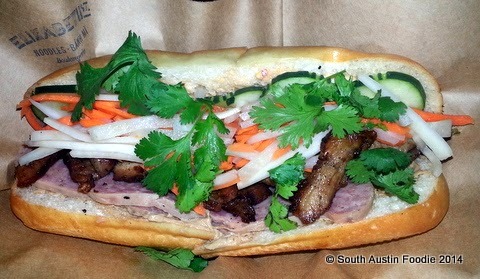 This is the #20, house specialty banh mi, which they gracefully let me substitute the roast pork for the marinated. They make their baguettes in-house, and it's the perfect consistency for this sandwich. A media tasting for the new summer menu at NoVa. 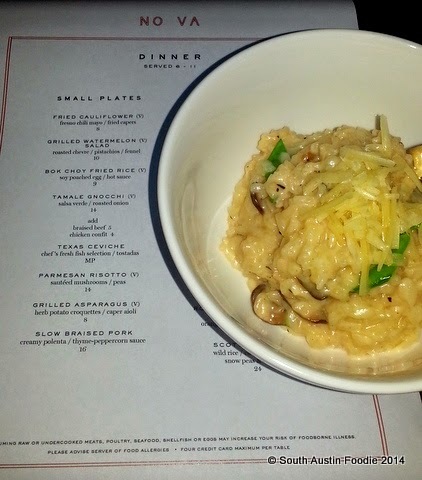 This was the Parmesan risotto, which several of us shared, and it was hard not to eat it all myself! We then moved a few doors down to Bangers. It was a rainy evening on Rainey Street, so we sat inside. Extremely loud! And as this was my first visit to Bangers, I was a bit overwhelmed by both the food and drink menus. 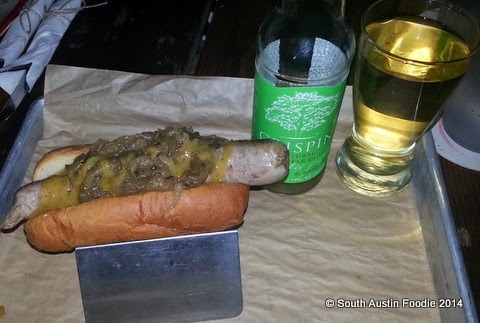 Ended up with the bockwurst (they make all their own sausages, and even have fresh ones available to take home) and Crispin pear cider. The movie Chef (see previous blog post) made me extremely hungry for a Cuban sandwich. 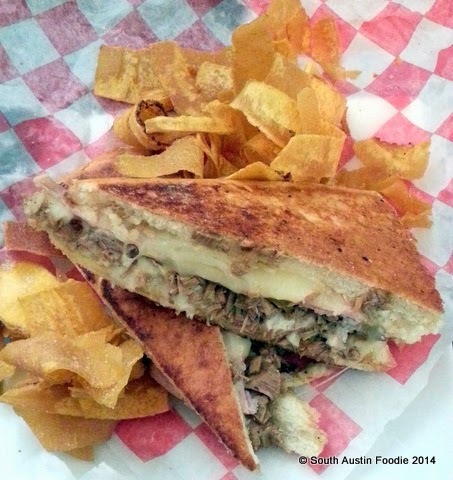 This one from the Texas Cuban trailer on South Lamar hit the spot! And finally, after watching a friend make pasta, I decided to dust off my pasta maker, and give it another try. The dough recipe couldn't be simpler: 1 cup of all purpose or double zero flour to 2 eggs. That's it. No salt in the dough, but salt your pasta water liberally. 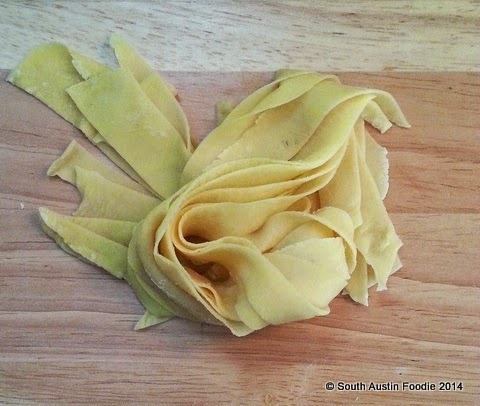 It all came together easily, and after repeated passes through the pasta machine, I had dough, which I cut (imprecisely) into pappardelle. 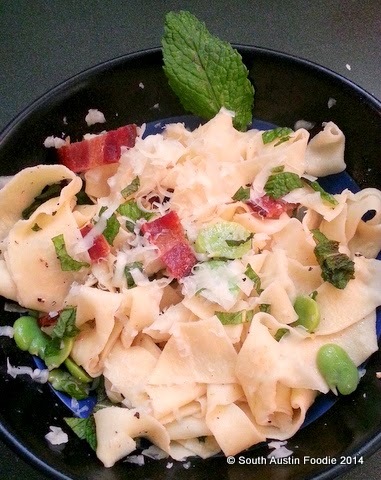 Which then became dinner with fresh fava beans, pecorino romano cheese, fresh mint, and just a little bit of bacon. I am pretty proud of this dish! So, just a little peek into my food world. Some of these pictures I previously posted on Instagram. Where have you been lately that's good? That pasta looks so delicious. I've been really wanting to make ravioli lately.